Obituary – Sparrow, Curtis Jr. « Perry High School Alumni Association, Inc.
Obituary – Sparrow, Curtis Jr.
﻿- age 18, is the son of Mr. and Mrs. Curtis Sparrow. He was born May 14, 1922 in Perry. He attended the Lutheran school and the Perry high school, and is a member of the Boy Scouts and Science club. Curtis has had charge of the lighting effects for the various school activities. Hobbies are chemistry, stamps, radio and photography. Curtis plans to attend Perry high school next year and take a post graduate course. Curtis Sparrow, Jr., fortified with the Sacraments of Holy Mother Church, Thurs., died July 15, 2004. Most loving and devoted husband of Bertha ‘Bette’ Sparrow (nee Bechtold); loving father of Carrie (Bill) Penny, Curtis W. (Eve) Sparrow, Ruth Sparrow (Alan) Gendron and Joseph Sparrow; dearest grandfather of Marvin ‘Doc’ Hankins, Amy Hankins, William (Marjorie) Sparrow, Athena (Dan) Gee and the late Marc Timothy Hankins; dear great-grandfather of Cody Hankins, Levi Brown, Noelle Gee and Alden Sparrow; dear brother of Geneva Porter; our dear brother-in-law, uncle, great-uncle and friend. 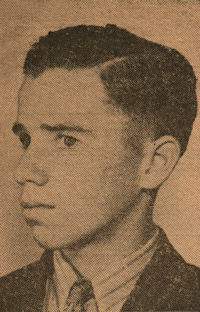 Curtis served during WWII and was a member of the Boy Scouts of America his entire life and received the St. George and Silver Beaver awards and started the Quarter Master Corps at Beaumont Scout Ranch and was a member of the American Legion and Knights of Columbus for over 40 years. Curtis was devoted to his wife, family, church and community. We will never know how many lives he touched. Funeral Mon., July 19, 8:30 a.m. from COLLIER’S Funeral Home, 3400 N. Lindbergh Blvd. (Bridgeton), to Holy Trinity Parish, Mass 9 a.m. Interment National Cemetery. In lieu of flowers, please make donations to the Alzheimer’s Assn. or Holy Trinity School, 10901 St. Henry Ln., 63074. Visitation Sun., 2-6 p.m.